Hooray! Today is the DAY! 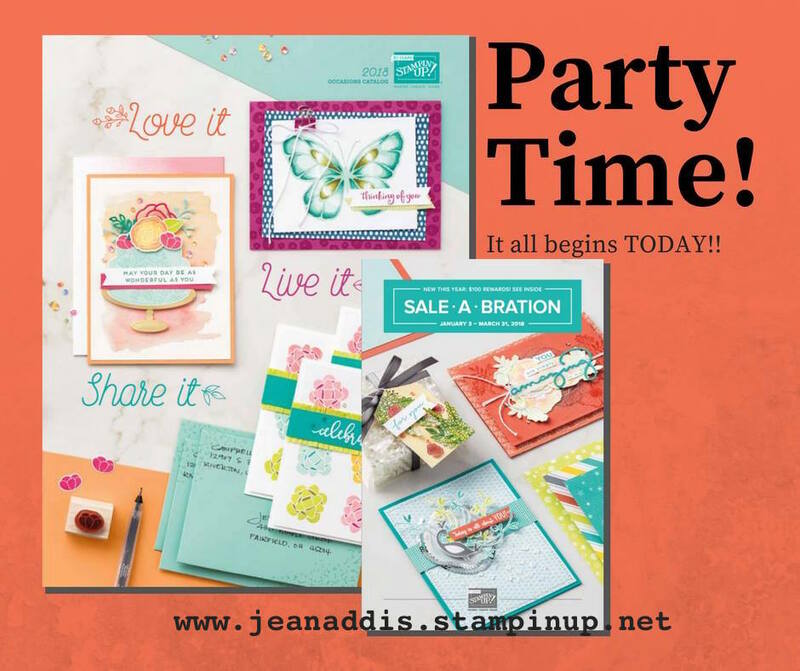 The new 2018 Stampin' UP! Occasions catalog is LIVE and all orders of $50 or more earn Sale-a-Bration rewards! Shop your Occasions catalog products and enjoy free Sale-a-Bration gifts with each $50 your purchase Jan. 1 - March 31, 2018. Click on the catalogs in my sidebar to see all the wonderful products. Please take special note of the two $100 level Sale-a-Bration items on pages 17 and 19! You can select one of those with your $100 order instead of two $50 level items! Do Not use the Host Code when placing an order $150 or more (before tax and shipping). Later this evening, January 3, 2018, I will be going live on my Jean's Paper Jewels Online Facebook page for my first Watch Me Wednesday of the new year. I will start live at 8:30pm ET, but you're welcome to view anytime. It's a closed group so just request to join. Thanks for joining me today! Happy shopping!